The May Meeting was held on May 21, 2015 at the Textile Center. We are really close to having enough participants to start a fourth Bee! Anyone wanting to be a part please contact Kristin. A new Bee will start soon if we have enough people interested. Blocks completed in the three other Bees for the month of May were for Sarah, Michelle, and Gina. They all looked great! We would love to have you take part in our blog! 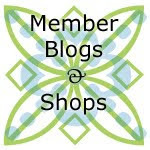 We do have quarterly topics, but are happy to have you blog about anything quilt-related. Please contact Sarah for further details on how to take part in the blog. A big thank you to our vice president Colby Lowrey for setting up the meet and greet at Quilt Market. It was a huge success! And thank you to Sarah for arranging The Cloth Pocket pop-up shop. Headed by Jan Hanenberger, the Committee has put a call out for orphan blocks and for members to make "Plus" blocks. They are hoping to have a total of 90 "Plus" blocks by September. Keep them in mind over the next couple of months as you are going through your stash of orphan blocks. Also, if you have ideas of where the finished quilts could be donated let Jan know and she will add it to her list for review. Please have all blocks turned in by the September meeting. More information on the Charity Committee and their goals for this year are up on the blog. The River Valley Quilters have asked they we come to their meeting on Thursday, September 24th in Woodbury to do a show and tell of our modern quilts and projects. If you would like to attend and need to carpool, please let someone on the board know and we will do our best to help get everyone there. Our In-Town Retreat will be held on Friday, September 25th through Sunday, September 27th at Four Seasons Quilt Shop. The cost is $15 per day. If you can't make it for the entire three days that is okay! Pick a day that best suits your schedule! Please remember that our June meeting will be on June 25th at 7:00pm. There is free parking across the street (kitty-corner to the Textile Center). Please refer to the maps for parking as there will be an event prior to ours and parking at the Textile Center may be taken. For the June meeting we’re hosting a "Make ‘n’ Take Meeting" - you will make and take home a portable design board and fabric twine using your scraps. Bring a pair of scissors and some 1-inch or thinner strips of fabric for the twine. If you have scrap batting that is 15" x 20" that you would like to donate to this project that would be great too. We will supply everything else. Don't forget your Show and Tell! Show and Tell - There was a lot of great show and tell, take a look at it all on our Flickr page!